We suggest you buy 12V-LED-SPOTLIGHT-BULB here instead. These 12 Volt MR16 LED spotlight bulbs make excellent replacements for energy hungry halogen equivalents. Each LED spotlight has 15 ultrabright LEDs producing a similar amount of light to a 20W halogen bulb while consuming just 1.3 Watt of power! The light generated is pure brilliant white (8000K). These bulbs are the same size as standard 40mm wide, 50mm long halogen spotlights, and offer an average operating life of 50,000 hours. 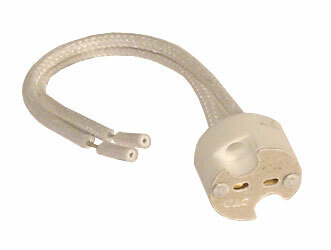 These bulbs can be used with existing 12V MR16 light fittings, or bulb holders such as the one pictured below from the REUK Shop. 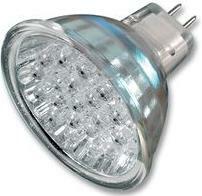 These bulbs are rated for use with 12 Volt DC systems. Their working voltage is from 10.5V to 13.5V. If the supplied voltage regularly exceeds 13.5V – for example, if they are to be powered by a 12V battery under charge – then the rated voltage will be exceeded and the lifespan of the bulbs reduced. If you think this may be an issue with your system (which is certainly is if you are using a 12V battery to power your lighting), then we recommend using a 12V low dropout regulator such as the LM2940CT pictured below. This integrated circuit will accept an input voltage up to 26 Volts DC, and output up to 1 Amp at 12.0 Volts – sufficient to safely light a string of multiple 1 Watt spotlights. A low dropout regulator must be used rather than the more common (and cheaper) 7812 fixed voltage regulator. Standard regulators have a voltage drop of up to 2-3 Volts, and so a 15V input voltage would be required to guarantee a reliable 12V output – not possible from a standard 12V battery. 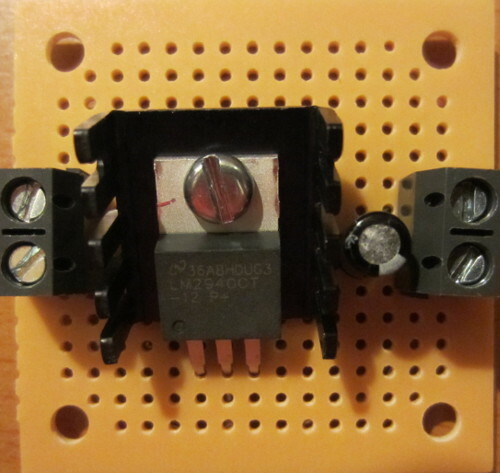 Low dropout regulators on the other hand have a voltage drop of just 0.5 Volts. Therefore, since a lead acid battery should have a voltage in the range 12.6-13.6V (40%-100% charged), this type of regulator is perfect. NEW To find out more about the LM2940CT-12 click here for our new REUK article. Click here to purchase (or to find out more about) the REUK 12V Voltage Regulator – rated at up to 1 Amp (= ten 1W spotlight bulbs) and perfect for use with 12V battery powered LED lighting circuits.